Donna with some of her acrylic paintings on canvas in her booth at the Toronto Art Expo 2011. 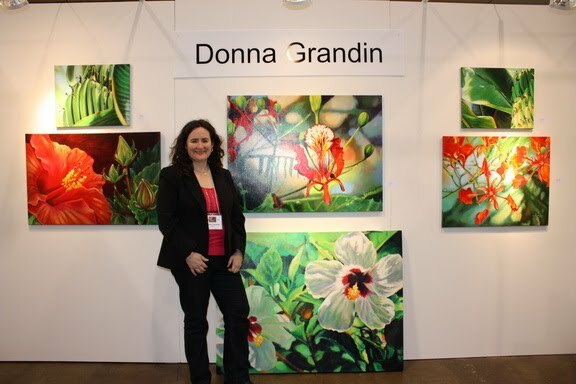 Last weekend, April 14-17, Donna exhibited her artwork with almost 200 other independent artists and galleries in the Toronto Art Expo 2011. The event was held at the Metro Toronto Convention Centre, and is in its ninth year. Attendence was lower than expected this year, not sure if the weather had something to do with it … it was a grey, rainy weekend, and at one point there was even some snow!!! Very unusual for this time of year. However, sales were made, new connections formed, and much experience gained. Thank you so much to those on Donna’s e-mail list who made it to the Expo, especially to those who live outside of Toronto. And a big thank-you to Donna’s new collectors, and potential collectors. For a pricelist of available paintings, please e-mail donna@bluerootsartstudio.com. Delivery and payment details can be worked out on an individual basis, depending on your location etc.